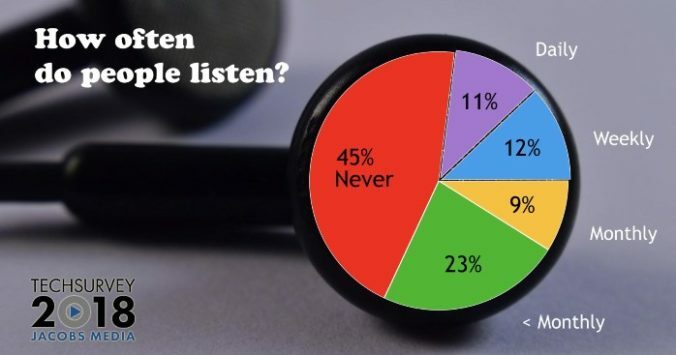 A majority of radio listeners surveyed by Jacobs Media for its TechSurvey 2018 said they listen to podcasts—including 11% who said they listen daily and 12% who listen at least once a week. It means nearly a quarter of radio’s listeners are consuming on-demand audio weekly or even more often. “That’s a number we have seen slowly but steadily increase over the years,” Jacobs Media digital dot connector Seth Resler said. It’s why he said the consultancy believes podcasting is the next big thing in audio. “Just like you’re seeing on-demand video content take over the world of television, we think on-demand audio growth trends are going to continue in the future for broadcasters,” he said. Resler said a podcast called “The Spiky Fruit” may sound like a cool title, but anyone looking for recipes using pineapple would never find the show. With more than 600,000 podcasts, he said it’s important that the show’s title and author offer some description or clue to what it’s about. That’s even more critical since Apple, where a majority of podcasts are consumed, only indexes shows by title and author—not the description. Resler also warns about stuffing too many key words into a show’s title. Apple has begun removing podcasts that it feels have over-stuffed titles. Podcasts like “This American Life” or “Wait, Wait, Don’t Tell Me” may sound easy to produce, but Resler said they’re tougher to create than may appear. Each has lots of moving parts with big teams of people working on them. “I would give some thought to that and what resources you have and what’s easiest to do,” he said. The easiest format is a host interviewing someone by phone. Another possible format is an in-person interview, followed by a multi-host scenario similar to a radio morning show. Resler advised newcomers to pick from that list of three. “These are very manageable podcasts to do and then you can grow from there as you get better at that,” he said. That first season may not be a first season at all, if Resler’s recommendation is followed. He suggests anyone launching a show make the first release a pilot season. “Come out and do a finite number of episodes and see how it goes. If it goes well, go back for season two. And if it’s a failure and no one listens to it, drop it and launch something else. And if it’s somewhere in between, then tweak and pivot.” He said a pilot season creates a natural point to stop and reflect on what’s working. Word of mouth marketing may help a podcast find an audience, but Resler thinks the best way to spread the news is for a podcast to tap into a preexisting audience. That’s perfect for broadcasters. “Radio is well-positioned to launch a podcast and build an audience for it by leveraging its existing fan base,” he said. Not only does it have on-air promos, but social media and email lists to leverage. 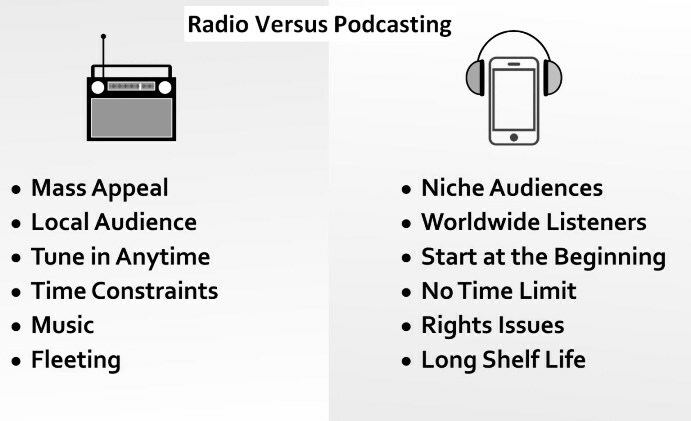 As a new medium for most radio stations with few expectations, Resler suggests heading into podcasting with some goals in mind. 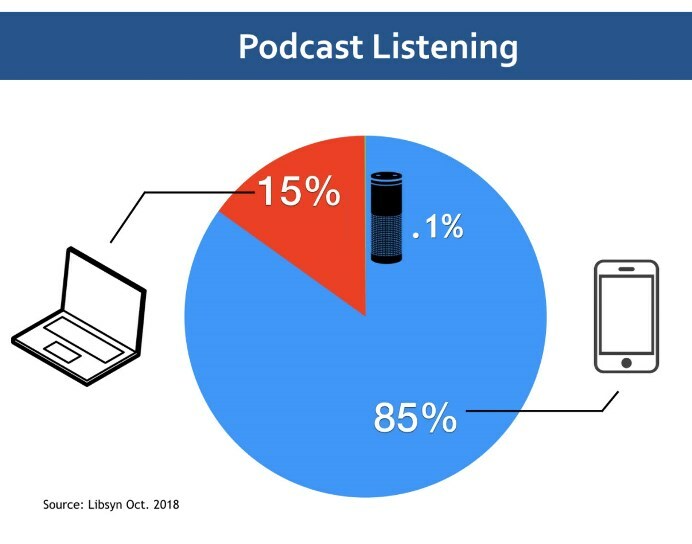 In terms of downloads, the podcast platform Libsyn said the typical show it hosts had 1,491 downloads (adjusted) in Nov.-Dec. 2018. He also points out that the typical advertisers wants about 5,000 downloads in a show’s first month before it has any interest in placing a buy. Fewer than 8% of podcasts on Libsyn hit that number, Resler added.